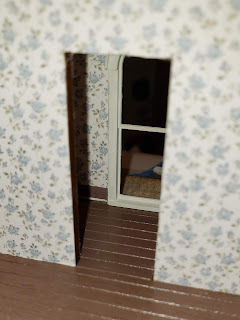 I'm wallpapering as I go and this tiny room in the tower is critical it be done as once the roof goes on, it will be very difficult to get in here. So this room needs it all, wallpaper, trim, flooring and the window. I even considered furnishing it. But I don't know for sure what goes in it yet. This pic just shows one of my clamping methods: exacto clamps. These are fine until I needed something wider than the larger ones go. Then I resorted to things like books, rubber bands and sand bags. All of which work for certain times but not always are best. Back to the tower room, I have a gap at the floor. Apparently the cut on the outer edge is uneven, but I think I can fix it. Yep, the cut out for the window fixes it. 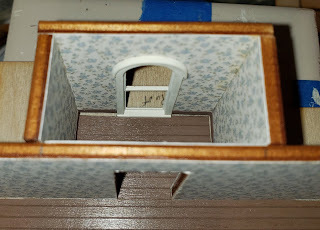 Here's the attic and tower room with all the trim in place. Both attic sections with the angled supports added. The back side is all trimmed. Lower two floors of the back all trimmed out. Not sure if I am ok with the off-white edge under the arch. Should I paint that brown to match the wood trim...? Just checking my alignment with the front to back. Here it is side by side with the attic level added. 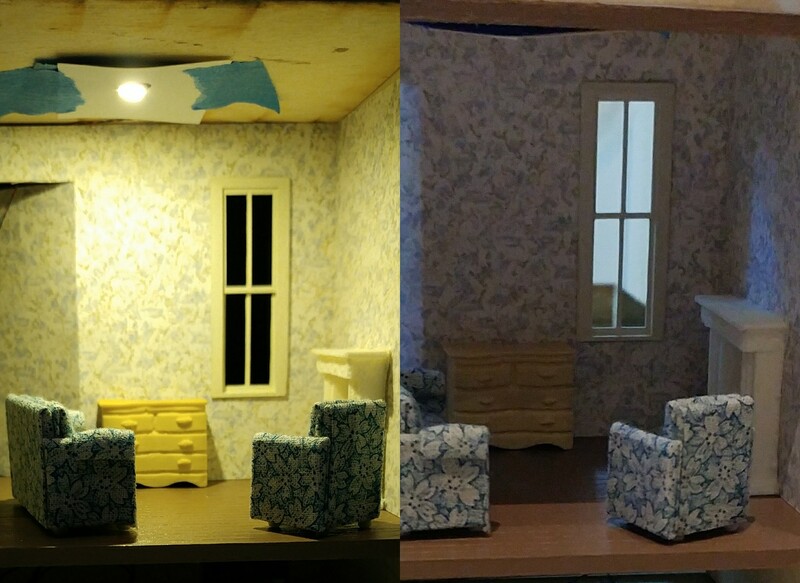 Adding lights and the drop ceiling to the attic. These holes were cut with a craft knife that rotates - meaning it is designed to cut curved. 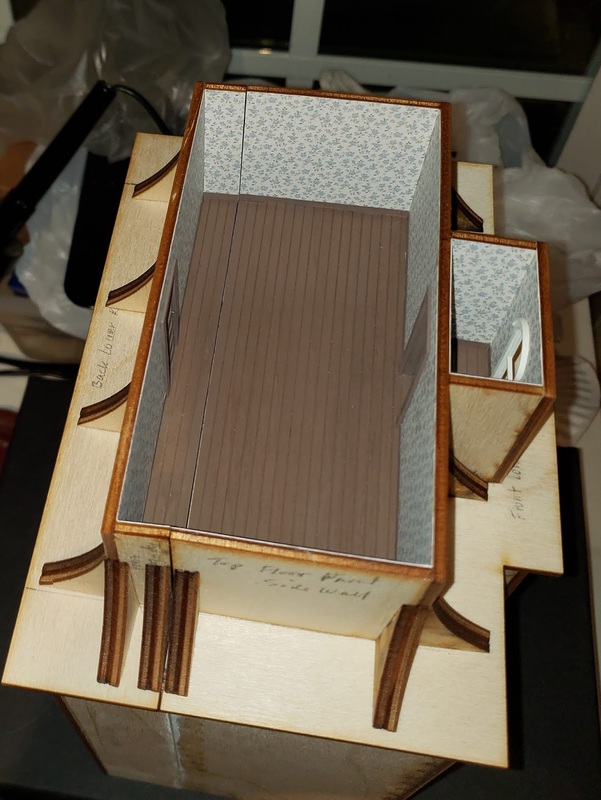 I added the drop ceiling to the back attic section, even with out lights, as well to be consistent. This pic shows my second method for clamping - clothespins. These are some plastic ones I got at my local Dollar Tree. They have a soft rubber like tip. But I use a protector to avoid marking the ceiling. In this case, I am using a piece of an old credit card. If a clamp is really strong, it is very important to have something in between the clamp and the clamped items. 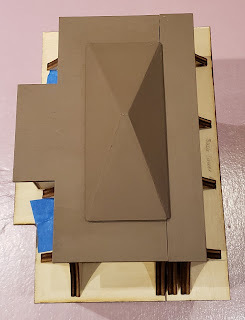 The roof peak was assembled, filler added and sanded. Then painted. The flat roof and roof peak were all added. 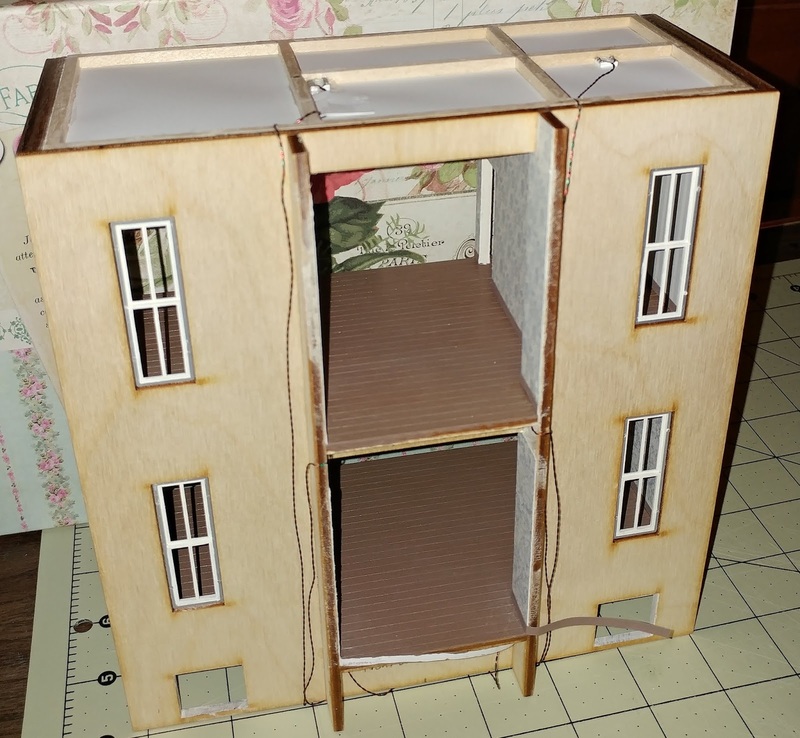 The back with roof on. 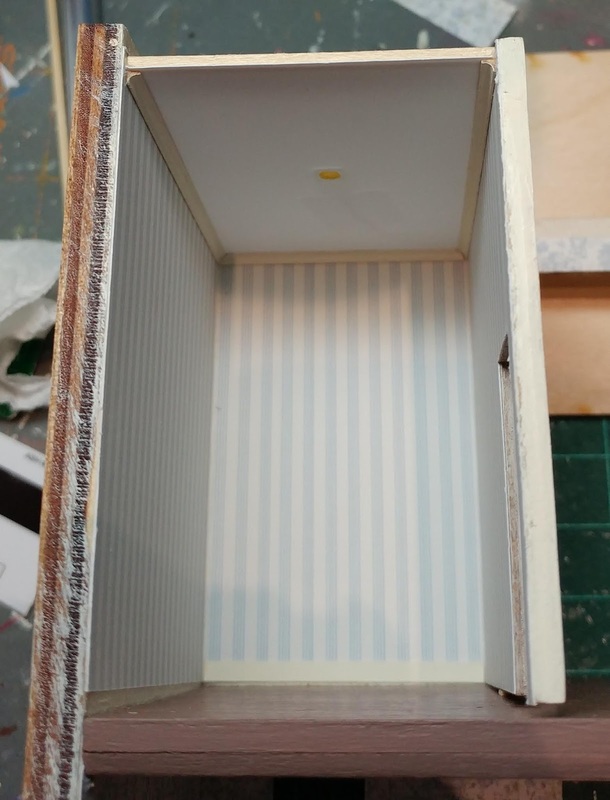 It bothers me when I see that unpainted and excess glue door. But know it will be covered up. The front with the roof and peak. Finally! 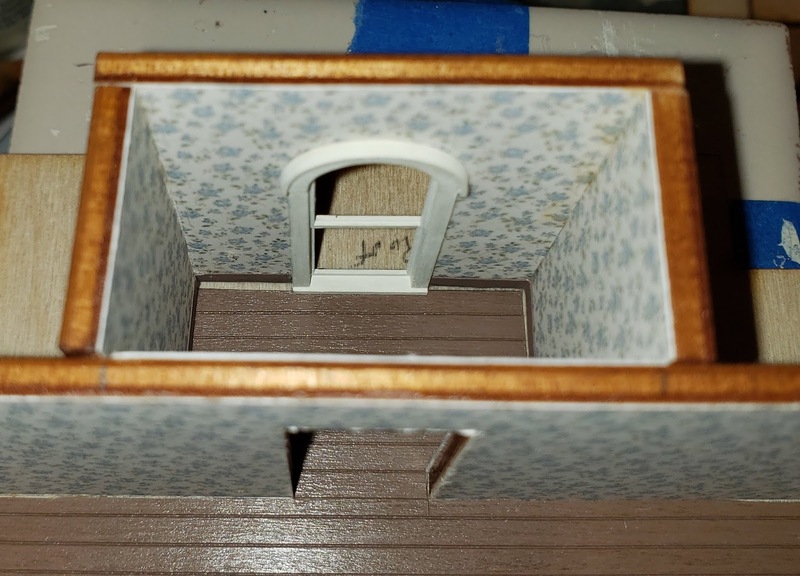 Interior with more trim added. The first floor middle doorway will be added later. 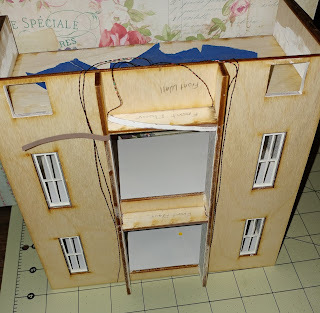 Here can see the wires coming out from the top floor ceiling (attic) and rather than go in the corner, I left them somewhat loose to go under the curved roofing yet to be added against those curved supports. The bay front for the first floor has the lower portico. 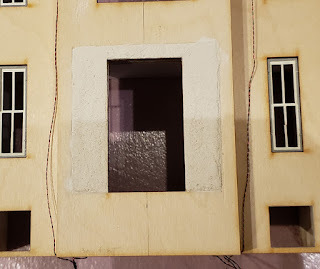 It will be open windows and this portion needed the stucco (wood filler). But I wanted to be sure it was flush, so I was very careful with adding it. I applied blue tape to the area I didn't want it to go. Still I had to do some sanding. The house with the lower and upper portico assembly on it but not attached yet. The upper portico is wallpapered inside and stuccoed outside. Keeping the stucco off the flooring and roofs was a real challenge. I used blue tape, but had to do some sanding and repainting anyway. I also found the extra pallet knives I purchased per the supply list helpful. I have started on the basement. The lights had been just taped in place. I am really glad I didn't try to start here and figure out the lights. Having the drop ceiling method already in tested and working well, made it a breeze to do this one. The biggest issue was the light placement. 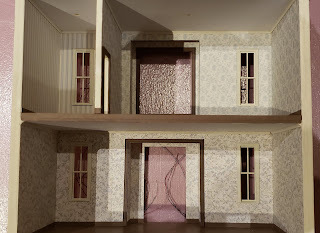 It was important to have the layout of the rooms in mind for the bracing in the drop ceiling as well. Notice the wires are a mess and not all taped under now. Those will all be hidden under the hill. But I am not sure how high or wide the hill needs to be. The project is on hold until I have a cover. 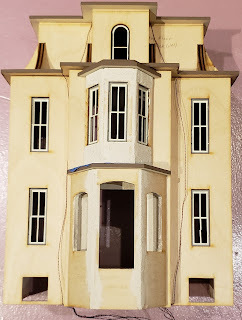 I've been itching to work on this big house (Petite Chateau by Suzanne and Andrew's Minis) for awhile and I finally cleared the deck and it is underway. 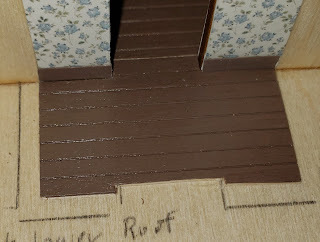 I really tried initially to follow the steps exactly, but then I didn't have the color paint for the wood floors. But I did have a stain pen. I was not happy with the results so decided to purchase color for the floor after all. I am glad I did. I also had no problem just painting over the stain after I sanded it of course. When I went to purchase a few items like paint, I couldn't find the exact colors but I found something I could be happy with. If one wants to use the exact colors, it is best to purchase around the same time as the kit is purchased. Otherwise the color might be discontinued. Or in my case, no longer carried by my local hobby stores. I bought spray paint in black and off white. 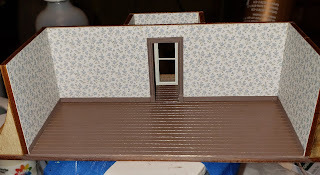 This paint was for the plastic windows and doors, plus other trim. The black was fine but the off white didn't matter as I had to paint over it anyway to match the actual off white I was using elsewhere. 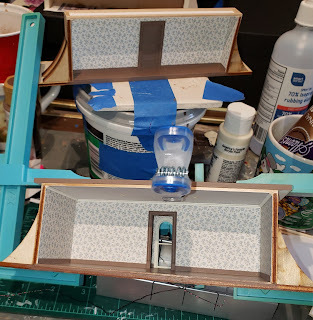 Also there were a few of the plastic trim that was to be painted blue and I could have just painted those directly. Oh and the spray paint I bought was the small cans. I don't do much spray painting so felt the small ones were worth the cost. Also they will be easier to store. 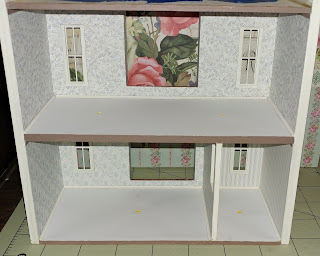 So I start assembling the house and right away I decided to deviate from the instructions. I am adding lighting so I have to some anyway. 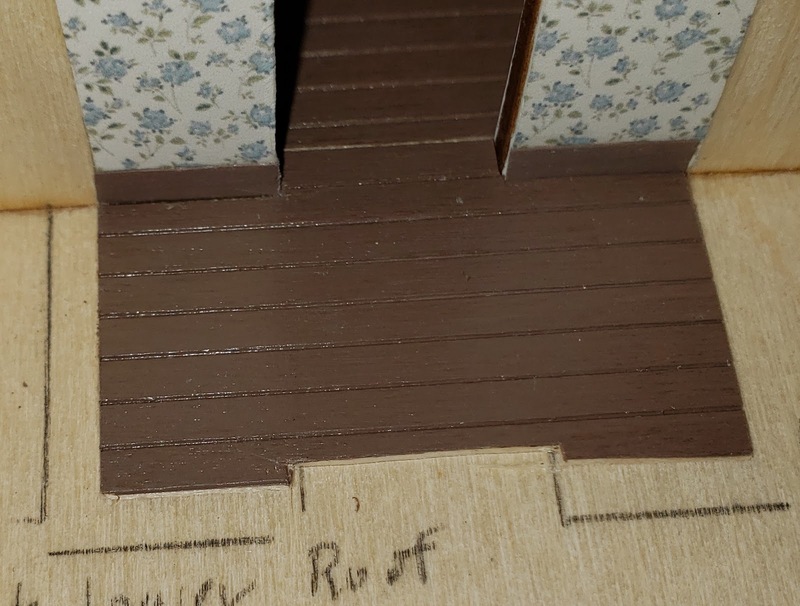 In most of the houses I have built before the floors have been two parts. A ceiling and then a floor above it, which allows the lighting wires to be sandwiched between. This house has a solid wood floor/ceiling. And they are wood. Did I mention that already? Meaning cutting isn't easy as say matt board. I decide I will add a drop ceiling for the lighting. 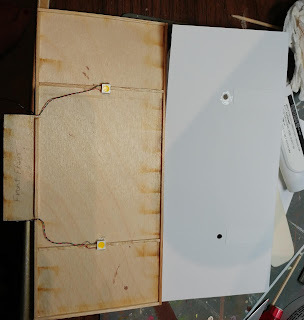 I've done drop ceiling in other projects using chip lights that are super tiny and thin. Also those were more whimsical so an uneven ceiling is not so obvious. I am using through the whole house warm white mega led's which are thick in comparison. I will need to add a way to allow for the depth of the lights across the whole ceiling. Before the led's were installed I did a test to see how much light they might show across half the floor. Note that bright spot in the center on the wallpaper is due to flash and not seen otherwise. Initially I was scared by how yellow they seemed. But in real life I prefer the warm white over bright white, so I decided I was good. 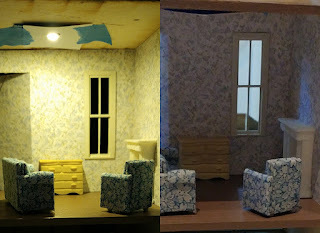 This test also proved that lighting was needed and that it covered the area well. Looking through my wood supply I come across 1/16 inch cove moulding, some angle ( like an L) and some channel ( like a U only flat). The last one I didn't have much of so I decided I would use the angle at the front to allow a paper drop ceiling. The cove moulding for 'faux crown' where the ceiling paper meets the wallpaper. This ceiling paper is like thin card (heavier weight than copy paper). 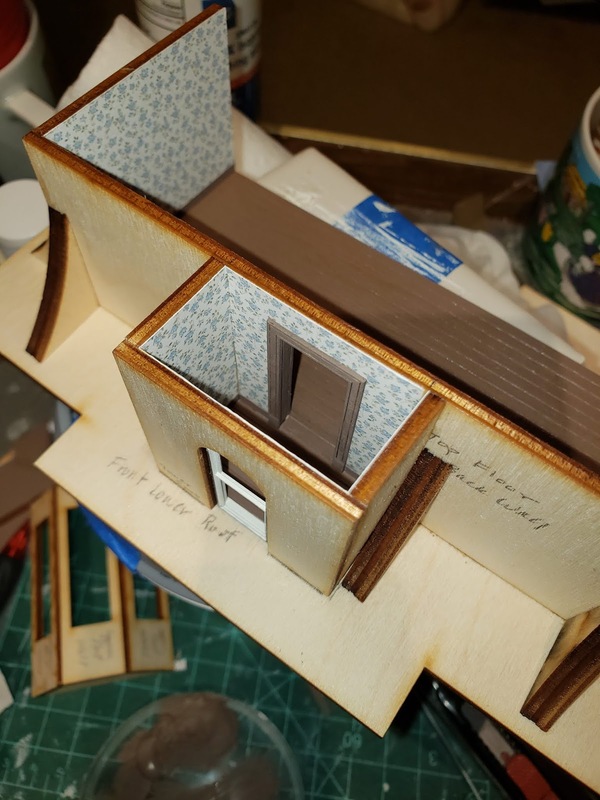 All this meant that only one point of the angle wood was glued to the floor so was kind of tricky to keep it from folding towards the inside. 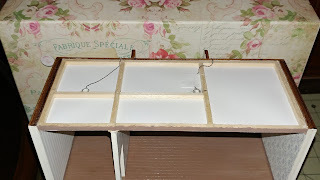 It was also tricky gluing the cove moulding in place as I didn't want to press too hard and have the ceiling warped. In this picture can see the angle has been glued so the opening is to the house and then all painted to blend with floor. Cove moulding added on the left side so far. 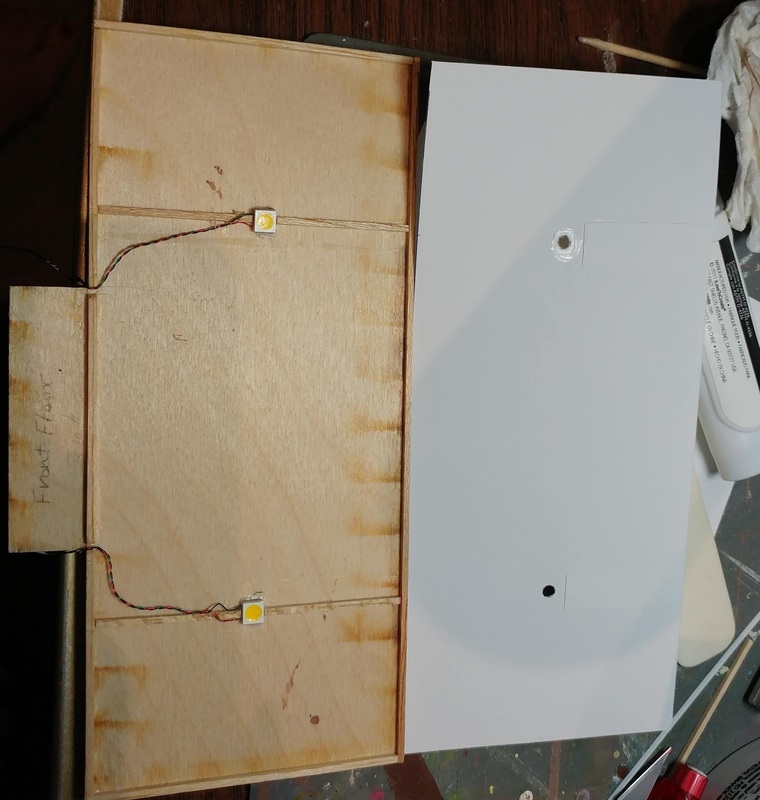 The light was glued to the paper and I used a 1/8 inch hole punch for the led to shine through. Unfortunately the hole punch was not a 'long reach' version so I needed to cut the paper to get to the proper position. 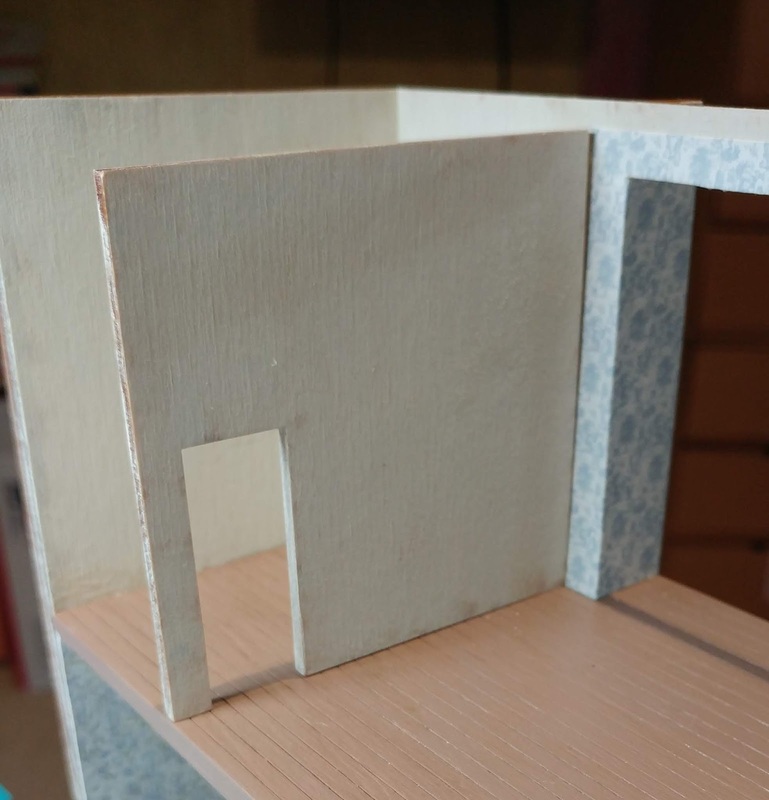 I then glued the slit as neatly as I could to a beam I added - not shown. 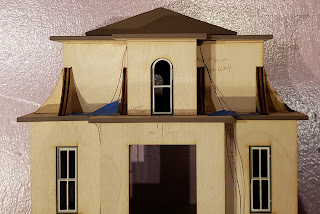 When I added the first floor ceiling/second floor I wasn't paying attention and making sure it was level front to back. I only noticed this after the ceiling had been added. I decided to deal with the gaps this problem caused, by covering with trim (even though I knew better). So I continued on papering the second floor and adding the bathroom wall. Looking at this pic can see the gap at the back. I decided to have the gap below so I could use the baseboard trim to hide. I had to sand the bottom of the wall so I could somewhat fix it. Notice that the walls are painted. I find this to be better for wallpapering instead of applying to the wood. I am using regular tacky glue to apply the wall paper. I apply glue to the wood rather than the paper (as suggested by the instructions) and spread thinly using a cut up credit card. I tend to apply too much glue, but the card just wipes it away. Then carefully placing the wallpaper (tacky is not as forgiving on positioning like the yes glue that was recommended in the instructions, but I don't have any). Then I used the credit card to smooth the paper to even out any glue humps. I don't really consider bubbling as don't normally have that issue with such with paper. I also use something called a bone folder for smoothing. It is good, but doesn't always fit inside a miniature, so cut up credit cards are great. With the bathroom I decided to change my construction method of the drop ceiling. 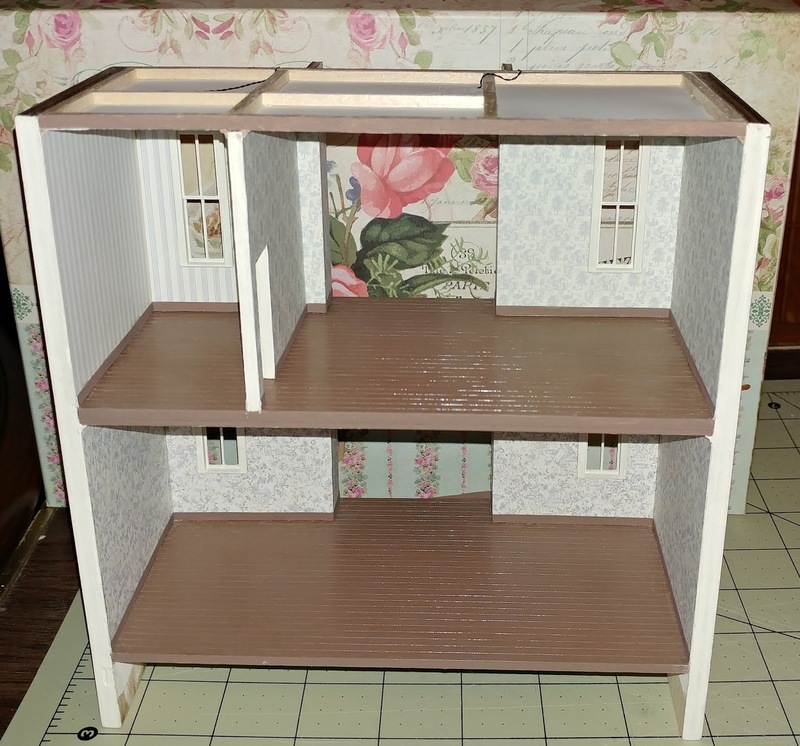 The ceiling wood piece (per instructions) will fit above the interior wall but inside the house side walls. So my drop ceiling will go below it and I decided to build it using square wood I had on hand instead the prior method. 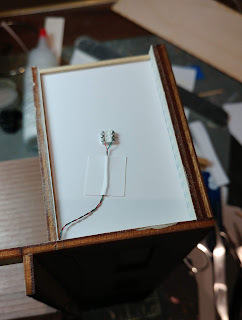 This shows the wood frame and how I glued the led to the paper. This looked great both from top and the underneath. The hole punch is slightly smaller than the mega led light. Look at that ceiling with the cove moulding. Fabulous. But notice the gap below. OK, easy to cover with the baseboard. 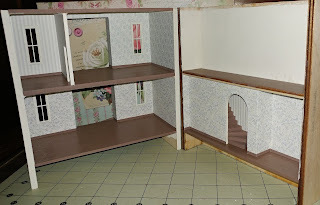 I installed the baseboard (quilling paper). But as I thought about it later, I couldn't stand the thought of the crooked floor. Furniture and so on would potentially make it very noticeable. It just wasn't sitting well with me. 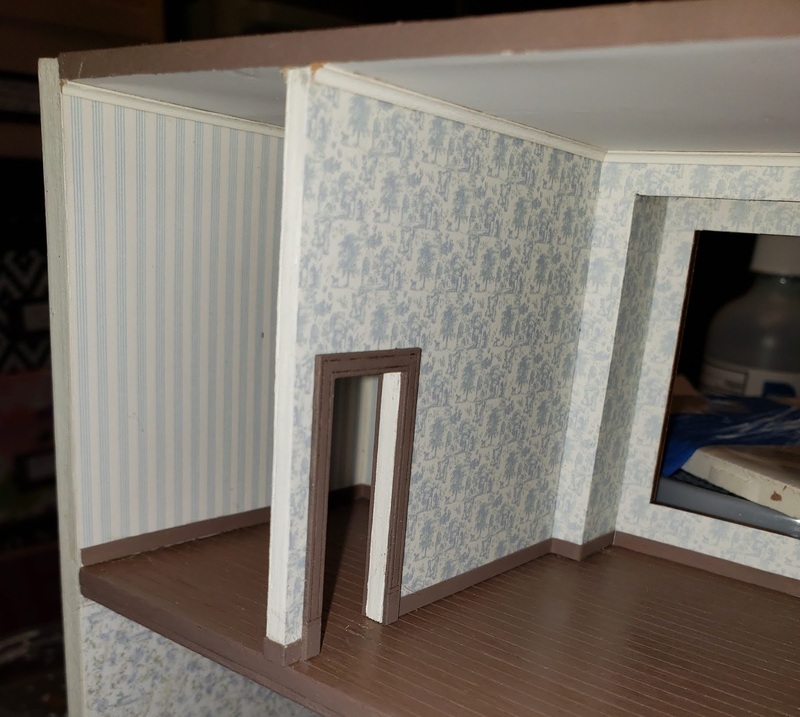 One of the reasons I hadn't tore out the floor before I started with the paper on the second floor, was that I had glued the drop ceiling and cove moulding to the wallpaper. Taking all that out was going to potentially ruin the paper. I just didn't have the patience to try to pull it out and not tear the paper. Which was likely to happen anyway. So I had continued on and there it was, haunting me with nightmares of the floor that was too high in the back. I kept thinking of that movie 'The Money Pit'. Finally, I ordered more wallpaper. This is when the thoughts of changing colors was again brought to my mind. The wallpaper was made by The Betterley's. As I was looking for the papers I needed I found that the same patterns were available in a rose color. That would match to other things I have already bought. It was a serious dilemma for a while. It would be easy to order a different color but the amount I needed to buy and whether I really wanted a pink interior won out. Meanwhile as I was waiting on the order to arrive, I tore out the wallpaper using a craft knife and isopropyl alcohol in a spray bottle. This wet the paper and glue which made it much easier to remove. I was also correct in that when I took the floor out, it took out the wallpaper below. Although I wasn't really trying to save it anyway. After my earlier experiments with the drop ceiling assemblies, I decided the frame was the better way to go. 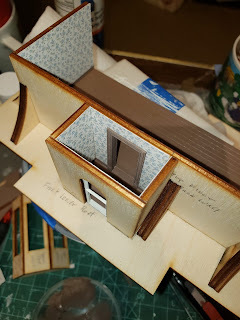 For the first floor ceiling I used 1/16th square wood but the same method on the holes. 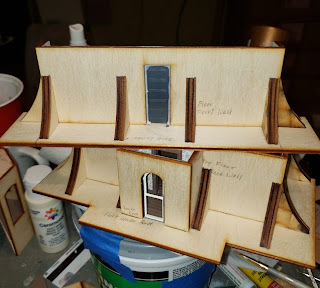 Only this time I glued the trim to the floor and also some support beam for the places I cut the slits in. The beams gave the light a place to hold against. The ceiling here is shown from the inside as it flips over to be glued around on the 1/16th square wood. I had been able to repaper the first floor as I had additional paper for the back side of the house (this house is cabinet type with front and back section). 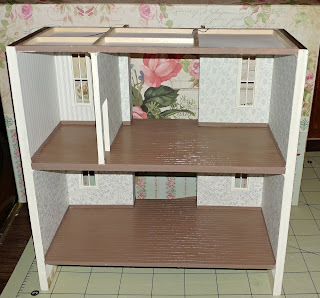 However, I didn't have enough for the second floor. So I started dealing with the decision around the second floor ceiling. To insert between walls and use the ceiling that comes with the kit, or make the drop ceiling deeper and have it be the only ceiling. 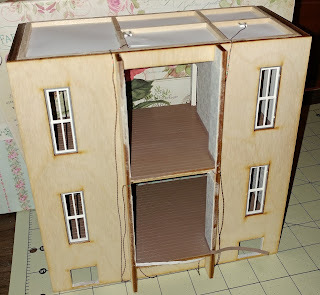 Since the kit will have a floor added above for the tower I choose the latter option. This drop ceiling will basically stand alone and not get glued to a floor above it when installing. I did need to find or order more of the square wood. I was able to find it at my local hobby shop. I bought the smallest and two other sizes. Now sold in packs of 5 pieces. Pretty good idea so that no longer have the sticker on the wood. Here is the beginning of this frame. 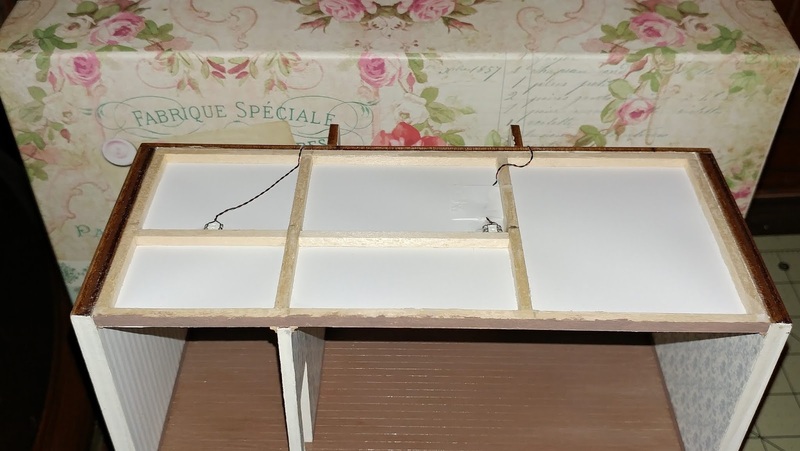 The frame fits inside the walls and has a brace for the wall. But I later added an additional brace for both the lights as well. Notice the wires are going out beside the Bay side walls. 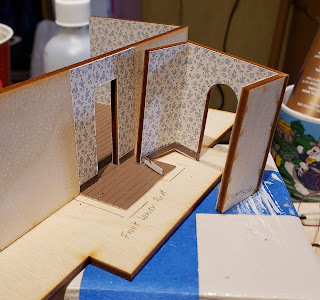 I thought I glued these extra walls too early, but looking back at the instructions, I wasn't ahead. I did it because of wallpaper wings and also they helped me determine where the wires went best for each floor so far. can see the wires come out and go to the bottom for now(shown as top in pic). I used my saw to cut narrow grooves in the wood for the wires. I did this whenever I felt the wire might be pinched. The first floor wires come out along the bay side at each floor. But this won't be seen once the house is assembled as the opening to the bay area is shorter. The wires seen at the very top of the pic above are for the basement I will add. All the wires are taped under the bottom (will be the basement) for now to keep them from getting in the way (and avoid attracting cats who might happen by). Couple of things I noticed when I took this picture - the second floor is only slightly thicker than the other two. Although the first floor will be thicker once I add the drop ceiling for the basement lighting. 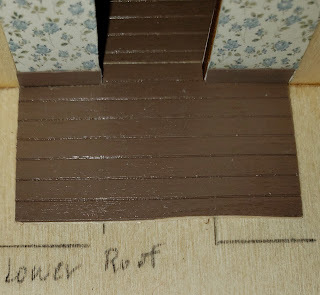 But I will use the thinner 1/16 inch square wood like I did for the first floor. For the second floor ceiling I used 1/8 inch square. 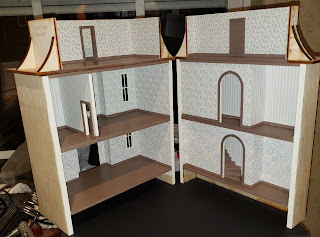 The other thing I notice is that the support for the first floor was left off since I am adding that basement. Finishing floor by floor - can I do it? I was trying to finish an entire floor including furnishings (like my mini friend Paula) but I just can't quite go that far. 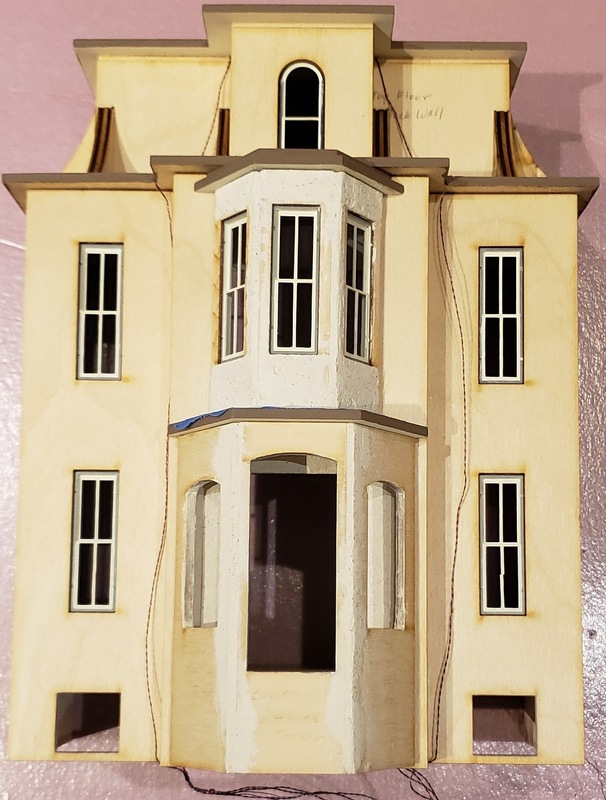 So I have just added all the trim, including the windows. This pic is the upside of the inside. Only showing to note the neat first floor (top) versus the not as neat second floor (bottom). I think I used too much glue. I really want to have some of those pistol grip type clamps. But so far I haven't sprung for them as they cost too much. I've used a variety of methods for holding/clamping for different parts. I have a 12 x 12 inch metal tray with magnets that I use. But even it isn't perfect for each step. I have had to re-do a couple of spots. I have some blue plastic hobby clamps that the larger ones barely fit over the house so far. Then I have also used spring type clothespins in several sizes including both wood and plastic. 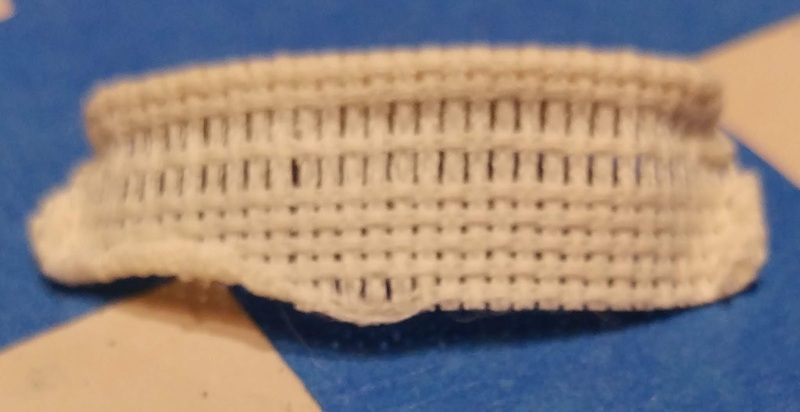 In a pinch I even used a rubber band which turned out to be the perfect size I needed at the time. I have started assembling the back. To assure alignment between front and back, I laid the front on its side and then marked where the floors were. Then I flipped the front to its other side and rotated the back so I could mark the other side. I then use my triangle to mark along the inside and across the back. 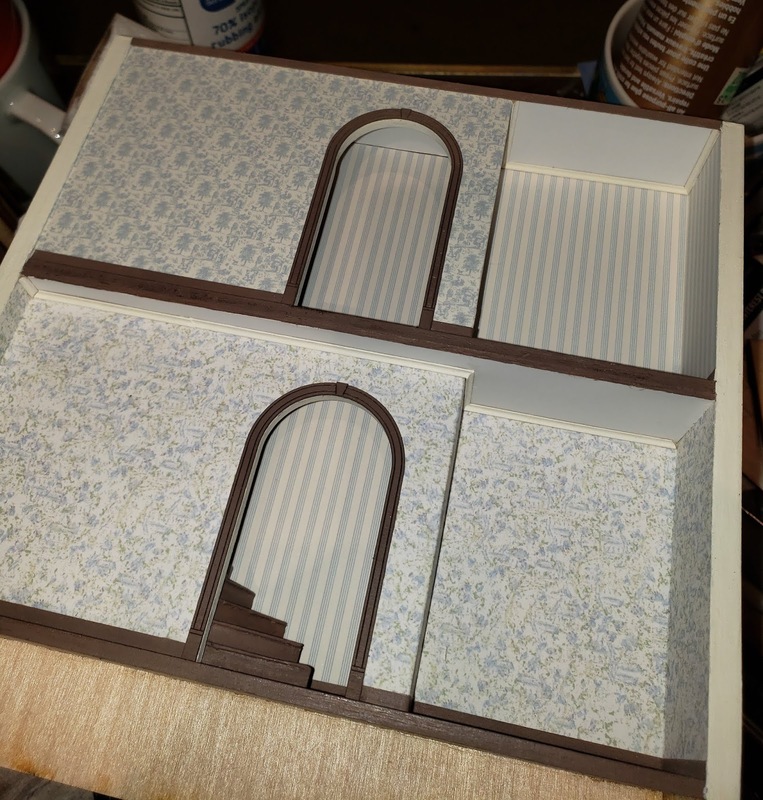 This was needed for the floor level and then also for where to wallpaper to. The second floor line is still visible here. 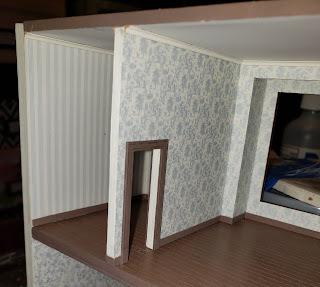 I didn't worry about painting to the exact line as wallpaper and trim cover it. 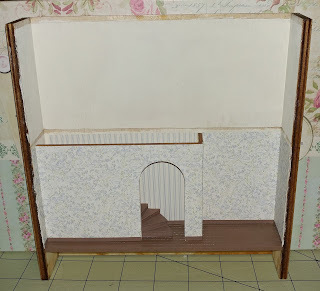 I did have one kit piece missing (or probably misplaced) and that is the second wall that would support this first floor stair wall. Since it wasn't going to be seen, I used braces instead. See to the left inside the wall. This picture well illustrates to me why I didn't need to change paper colors. I already had to order more to replace the ones I messed up, but was also buying for the basement. If I had decided to change colors, well, that meant I was buying even more paper. 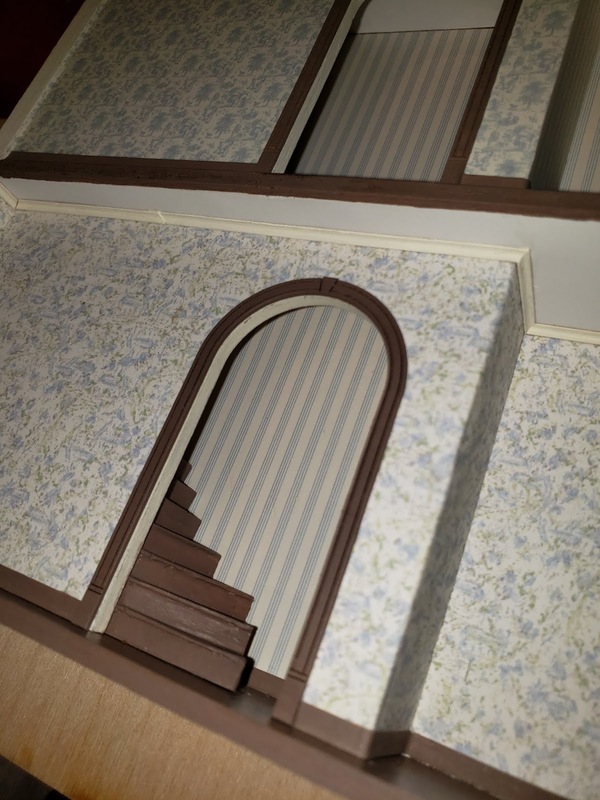 This stairwell was the single reason I didn't switch the house around - especially the back. The lower stairs (stairs came in two parts) were for this angle and even flipping this wall wouldn't have been enough. Sometimes when assembling a kit it just isn't worth the hassle to change each thing so sticking with the plan is best. 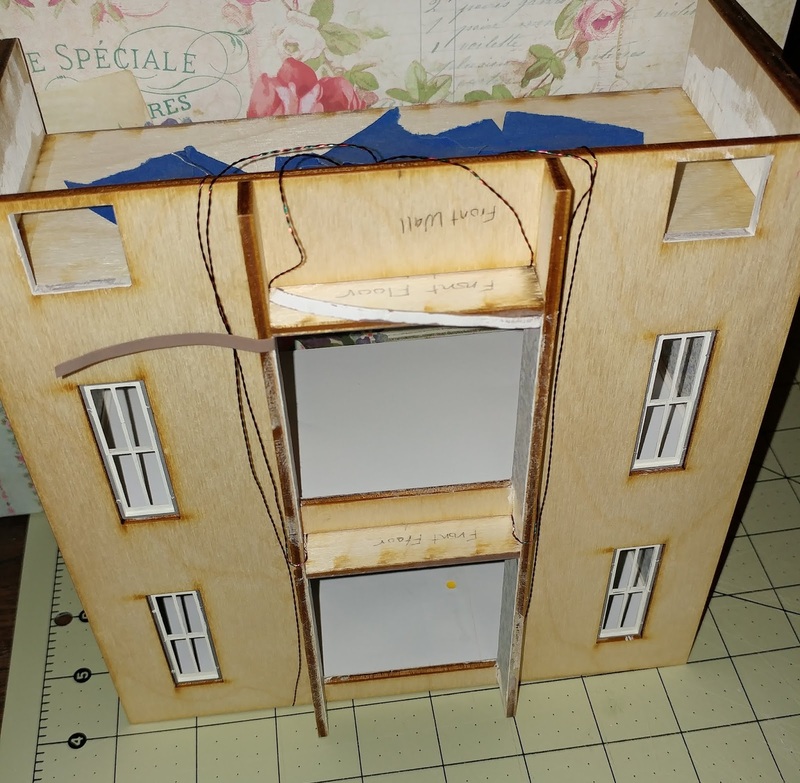 The back shows the second floor added, but it isn't glued yet. 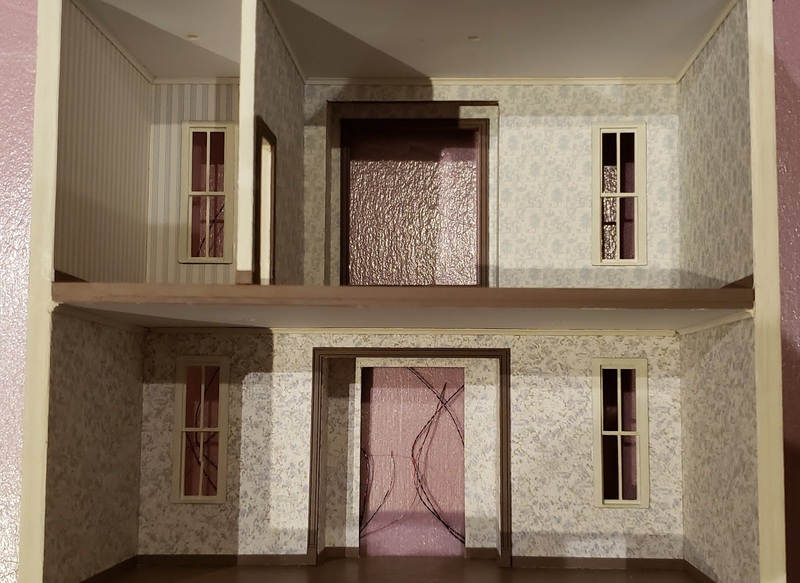 But note how the faux (no lights) drop ceiling is thinner than the one that will be used for the top. This matches to the thickness I used for the first floor ceiling on the front. 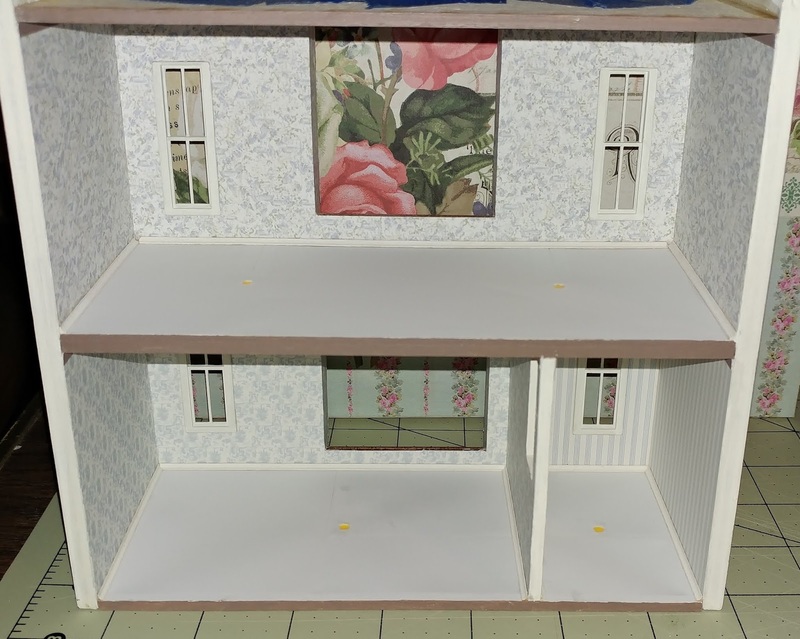 Actually for the top floor on the back, I can use the intended ceiling instead of a faux drop ceiling since I am not adding lights on the back side. Well, that is my progress so far. For my Egg House, I needed a sofa of some kind. But the walls are round and the floor is not level. So a traditional sofa with square back and bottom wasn't going to work. I had been looking at some wicker on etsy, but I wasn't interested in purchasing anything more for this project. So DIY to the rescue. I decided to use the oval woodsie as is, but could consider cutting it at the ends and reshaping with sanding block. I cut a 2 inch by 1 and half inch piece of the canvas, but later after determining an approximate size to attach the woodsie, I was able to cut it closer to 1 inch tall. I use my tweezers to pull at the threads of the canvas. I made sure to pull threads that go horizontally. 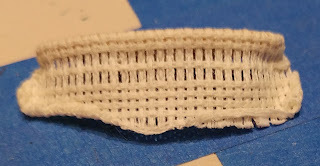 I did this to two rows, but could be more, less or double rows, whatever strikes ones fancy, including removing portions and gluing the remaining threads in place. This photo shows the two rows and after I have glued around the woodsie with 2 or 3 rows left to wrap around the bottom. 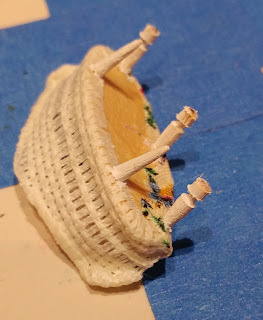 If I were planning to not add a cushion, I would recommend to paint the woodsie before gluing, then no paint would get on the wicker part. Also the bottom opened row did not show later when I added the cushion, so it should have been glued a row or two offset. 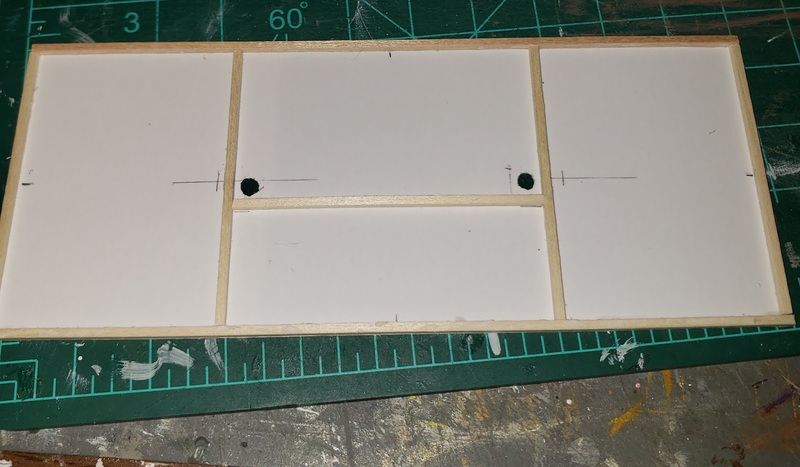 To reduce bulk in gluing, I removed the horizontal threads from the bottom two rows that I overlapped the woodsie and glued to it. When I use glue, I have a little glue. 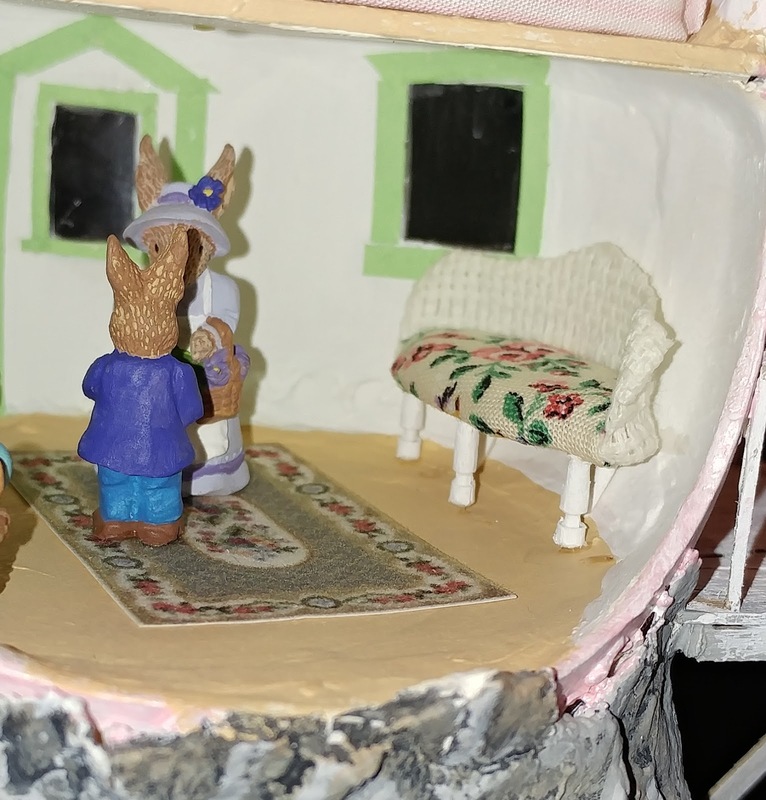 Using too much glue will require it to be removed and it may leave smudges, etc. I also use a toothpick or my needle tool to apply glue, not the bottle. That is unless using a tip bottle, which I could never keep the nozzle clean so don't use anymore. Once the bottom was all glued down, I started curling back the sides. I just folded back a little at a time and added little dabs of glue as I went. Then I looked at what to do with the top. Notice the rolls sides but flat top at the left. To do this I started in the middle pulling the threads up, but not fully away. 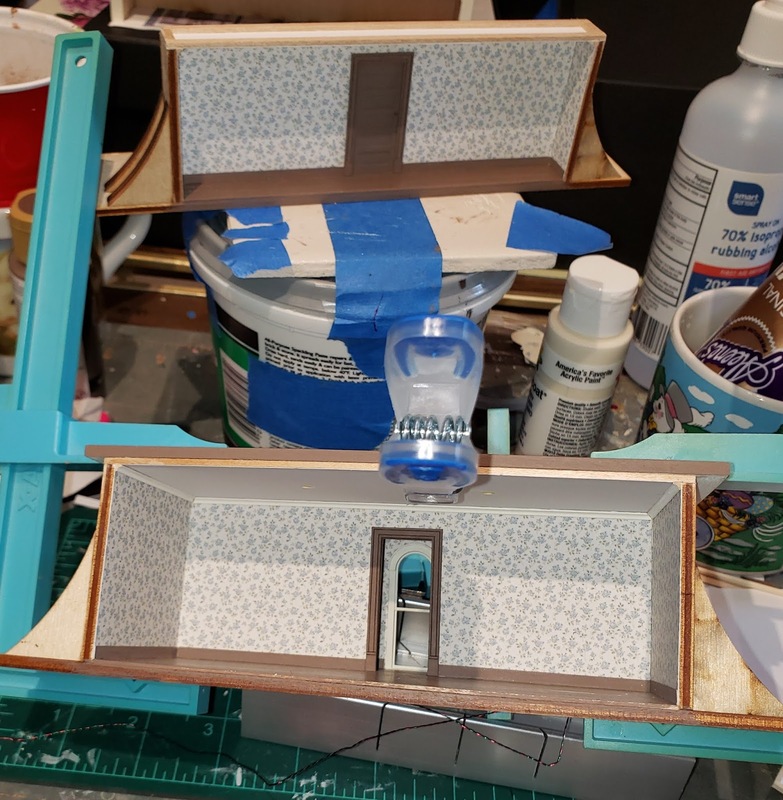 I tried to do so again, but since I didn't have any or enough glue, I ended up going with the roll towards the seat instead. This photo shows before rolling on the left. The horizontal threads that I pulled out were glued in place, then the vertical threads glued over them rolling as gluing and holding with my fingers. I kept doing this until it would hold on it's own. All finished with the back. Note threads could still be removed at this point. Just cut them at certain points before pulling on them. Gluing were cut for any that are left. Next I cut my legs. I cut them a little too long. I cut them at the second notch from the bottom because it is what I liked. But I should have measured and accounted for adding a cushion. Since I hadn't decided to add the cushion yet I didn't realize they were too long. But later they were. However since this is for bunnies, I determined it was good enough. Note in the pic I cut away the threads for the back legs and added the front legs at the sides of the threads. 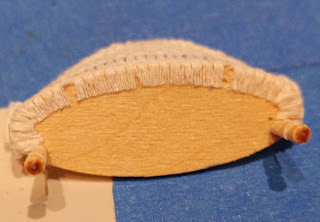 This way the leg is glued to both the wood seat and also the threads. My next step was to make the cushion. I used a second woodsie as a pattern to cut the egg carton foam. 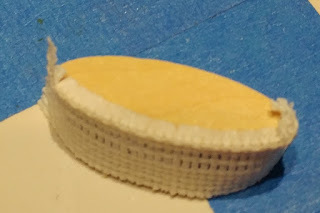 I trimmed about 1/16th of an inch around the egg carton foam so that it wasn't overhanging the front and also to accommodate space for the fabric against the back. 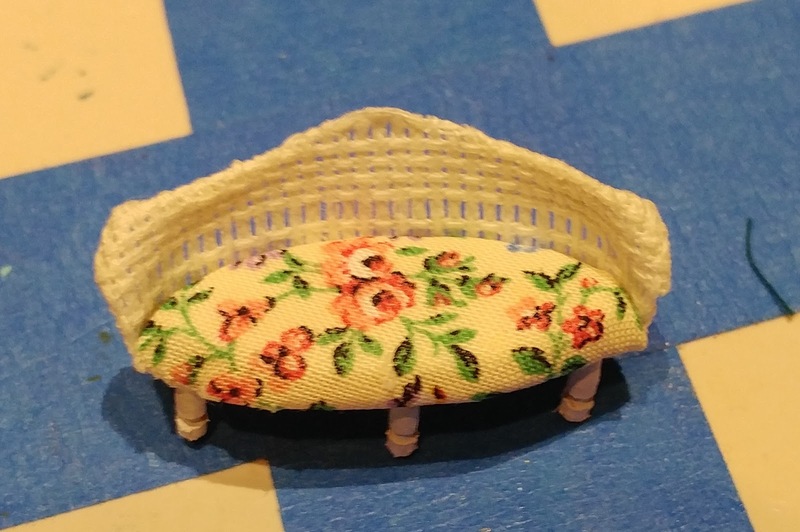 I cut my fabric to give a good pattern on the seat. 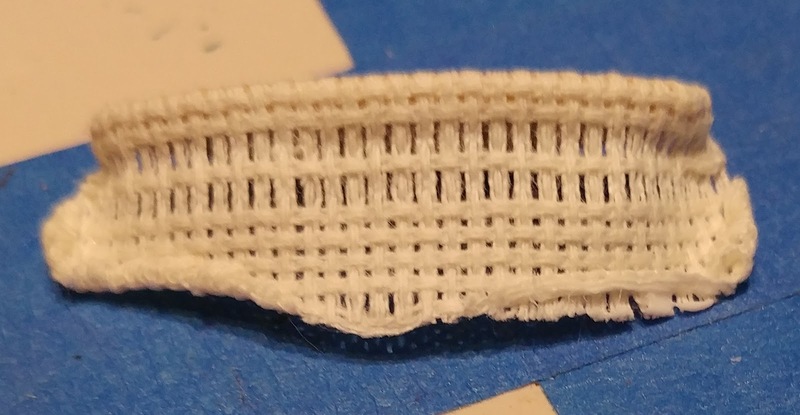 This meant I was a little tight on my edges to glue around, but I made it work. On the other side, I had more fabric and I just trimmed as needed. I started with the cushion gluing the back of the fabric to the foam, then glued the foam to the woodsie with that to the back. 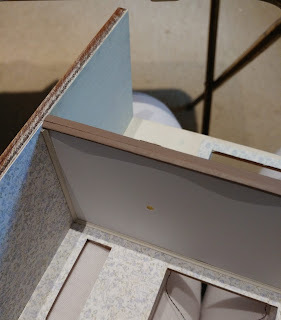 Then I wrapped the fabric over the foam and the wood to the underneath as shown in the photo. 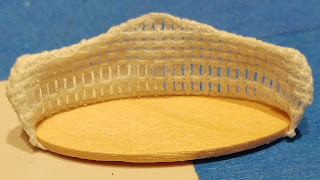 To be neat at the edges, I had glued the sides to the foam, and this created a fold, so that is what was glued at the edge of the seat. I cut little flaps with the fabric since this curved, so the front of the seat cushion would be smooth. Gluing as I went. This shows my decision to add a third front leg. The orignal plan for the back legs was to cut so I had the extra notches of the curved part of the toothpick. Since I wasn't measuring those were too short. So instead I cut off the tips of the toothpick for the back. 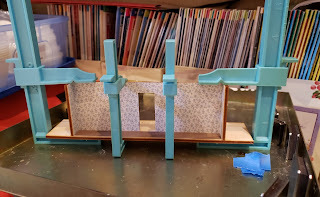 I didn't worry too much about them standing straight as I wanted the sofa to fit in the egg house in a specific spot, so as they were drying, I did place in the house to position the legs. 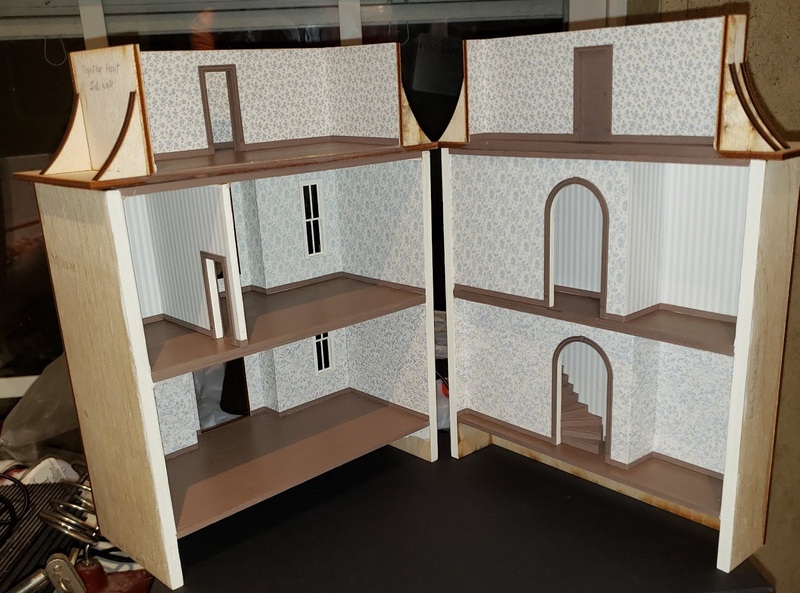 If my legs in the back and front were too long and I wasn't pleased with their height, I could have removed them, cut them down and then re-glued. The main reason I wasn't measuring is it would be difficult to do so in this house. Also my floor isn't totally even, so they didn't need to be exact. I painted the legs and realized I needed to do some sanding. 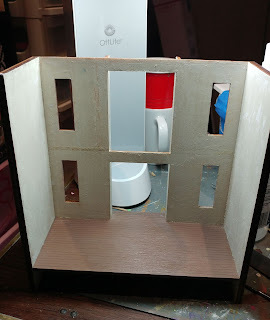 This is ok, since it is good to paint and then sand and then add the second coat of paint. However, I should have sanded the legs before I glued them on. Here is my finished wicker sofa. This photo shows yellow as I didn't use a flash and it self corrected for so much blue. But it really is white, with cream colored fabric. Here it is in the Egg House and can see why I might have made the legs shorter but also why the legs needed to be flexible when positioning before the glue dried. I probably had room for a matching chair, however I wasn't prepared to make one.